The World Needs A Stronger Blog...: "The Cowcatcher"
In railroading, the "cowcatcher" is the broom-like device mounted at the front of a locomotive to deflect obstacles from the track that might otherwise derail the train. Its now more commonly known as the "pilot"
Cowcatcher is still the common layman's usage, but this term is deprecated and has not been used by railroad workers for more than a century. The device itself was invented by Charles Babbage in the 19th century, during his period of working for the Liverpool and Manchester Railway. On a road locomotive, the cowcatcher has to successfully deflect an obstacle hit at speed; the ideal is to push it upwards and sideways out of the way. The locomotive should not lift on impact or the train will follow, and the ideal is for a fairly smooth structure so that the locomotive will not get caught and pulled sideways off the track either. The typical shape is a blunt wedge that is shallowly V-shaped in plan. In the later days of steam locomotives, the front coupler was designed to swing out of the way also, so it could not get caught up; this was called a drop coupler pilot. Early on, pilots were normally fabricated of bars mounted on a frame; later on, sheet metal pilots were often used for their additional smoothness, and some cast steel cowcatchers were employed for their mass and smooth shape. 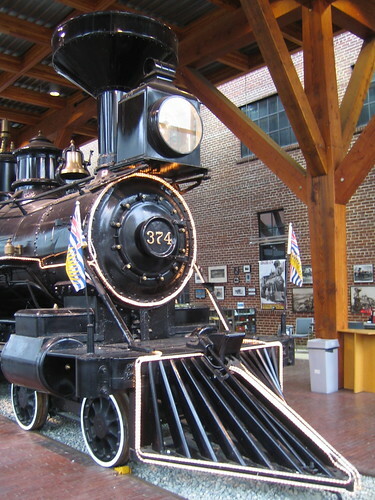 Early diesel locomotives followed the same plan. Slower speed locomotives often had a cowcatcher with steps on it to allow yard workers to ride on the locomotive; these were called footboard pilots. Footboard pilots were outlawed for safety reasons in the 1960s and were removed. Modern locomotives often have front and rear platforms with safety rails where workers can ride. Modern diesel locomotives have flatter, less wedge shaped pilots; this is because a diesel locomotive has the cab near the front, and the crew are vulnerable to impact from obstacles pushed up by the pilot. Indeed, most are fitted with a device known as an anticlimber above the coupler to prevent struck objects from travelling up over the frame and through the cab area.